Yesterday, we were checking wheat fields in Adams, Lincoln, Douglas, Grant, and Whitman counties of Washington. Winter wheat crops ranged from early jointing (Feekes 5) to boot stage (Feekes 10). Stripe rust was found in few fields and generally low. No rust was found in most of the checked fields. In the fields found with stripe rust, just one or two infected leaves were found. Only in one field along Highway 2 in Lincoln County, stripe rust reached 5% incidence with small hotspots on low leaves (Figure 1). No rust was found in commercial fields in Whitman County, but stripe rust was found on susceptible checks in our experimental fields near Pullman (Figure 2). Rust was on low leaves, indicating that the stripe rust pathogen overwintered. This time of year to see stripe rust starting to develop is normal for the Palouse region. Figure 1. Active stripe rust found in a winter wheat field in Lincoln County, Washington on May 7, 2018. Figure 2. 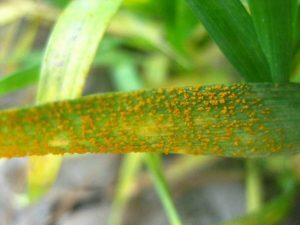 Active stripe rust found in an experimental field in the Palouse region on May 7, 2018. Although stripe rust pressure is relatively low in the eastern Pacific Northwest compared to this time of the last year, growers still need to pay attention to the disease because rust is in the region and can develop quickly under rust-favorable conditions. The recent weather conditions and those forecasted for the next couple of weeks are conducive for stripe rust infection. Moderately susceptible and susceptible varieties of winter wheat (ratings 5-8 in the Seed Buyer’s Guide) need fungicide application. For the winter wheat fields that have been applied with fungicides, check the fields 3-5 weeks after the previous application depending upon fungicides. Most fungicides containing one active chemical, such as Tilt (propiconazole) and Headline (strobilurin), protect crop for 20-30 days, and fungicides containing two or more active chemicals, such as Quilt Xcel (azoxystrobin + propiconazole) and Trivapro (azoxystrobin+Propiconazole+Solatenol) protect crop for 30-40 days. When activating rust pustules appear in fields, fungicide application is needed. Fungicides are not recommended for fields grown with resistant and moderate resistant varieties (ratings 1-4 in the Seed Buyer’s Guide) unless active rust pustules are easily found in the fields. Spring wheat crops ranges from just planted to early tillering (Feekes 2), and planting is not completed. Depending upon the early or late planting, fungicides may or may not be needed at the herbicide application time. The general recommendation is checking fields and using fungicide only when active rust can be found. The previous update in April, stripe rust has been reported in California, Kentucky, Kansas, Illinois, North Carolina, and Virginia. Thus, stripe rust has been reported in 15 states (Arkansas, Texas, Oregon, Washington, Mississippi, Georgia, Tennessee, Oklahoma, Louisiana, California, Kentucky, Kansas, Illinois, North Carolina, and Virginia). 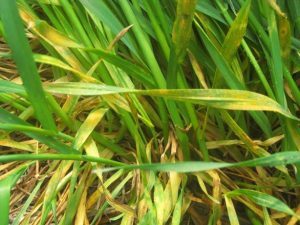 Although stripe rust has been relatively low compared to the past three years, it may reach an epidemic level in some areas. Fungicide application may be needed, depending upon the region, crop stage, variety susceptibility, and rust pressure. Follow regional recommendations for disease management. View the May Stripe Rust Update (pdf).